We had a family reunion at the villa and all had a great time specially the kids with the swimming pool. There was 10 of us and there was plenty of space for all. The villa was spacious, well presented, kitchen well equipped. The swimming pool a big bonus. Pascal was very helpful and responded quickly when we needed him. Good location too. Will definitely recommend. Brilliant rural french house with pool. We took 8 but 10 easy would fit. All beds were comfortable and rooms were of a good size. Nice pool with safety fence and nice grounds with boules court. Pascal showed us round on the day we arrived and was a very good host we did not need him until the day of departure. The house is full of caracter and has great features. Outside there are two barbeques which we used and the outside dining area was excellent. The location is great sandwiched between la colle sur loup and st paul de vence both are a must for any tourist or local. La colle is a 15 min walk st paul 30 mins or uber 8 euro. We had guest fly in to nice which is 10km away so really easy for them 22 euro on uber. Supermarkets are within 2km of the house so you will need a car. We took our dog the house is securely fenced and he loved it. A truly beautiful and amazing comfortable place for a family holiday. 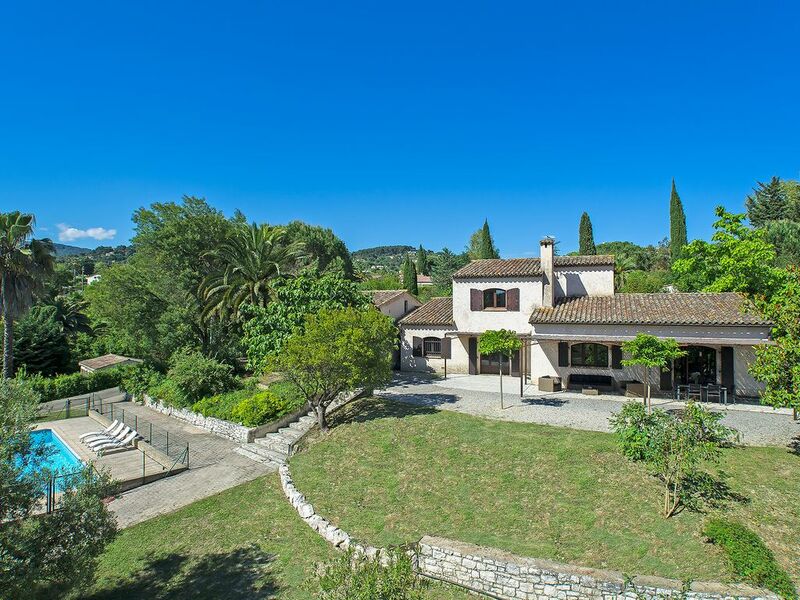 This is a beautiful traditional french family home with a tranquil garden and fantastic pool. The kitchen is fully equipped for large numbers and all the bedrooms and the living room are very comfortable. It's easy to find shade from the sun if required with many lush trees casting shade and the pool is safely fenced and alarmed protecting children from danger. Communication with Pascal the owner is very good before and during the stay. For those who love the outdoors there are many lovely places nearby especially if you have a car. St Paul de Vence is magical and in comfortable walking distance up the hill. The 400 bus service is very reliable and will take you all the way to Nice for 1.5 Euros. There are supermarkets a short drive away and a lovely patisserie. Highly recommended, would go back tomorrow if we could! great house, great area, everything as expected! It was a great house to stay with kids and it had everything needed (high cairs, cribs). Kitchen is big and well equipped, BBQ, Nespresso Machine, etc. Easy communication and transaction to rent the house. Heel fijn ruim huis met alles erop en eraan .1 nadeel is dat de terras overkapping niet waterdicht is bij regen. Je kunt dan niet buiten eten terwijl de temperatuur het wel toelaat. Nous avons passé un très bon séjour dans une région très agréable et intéressante à plusieurs points de vue. La villa est spacieuse , agréable et la piscine en contrebas permet de passer un séjour tranquille et respectueux de chacun.